Feast on a new cookbook from local catering superheroes, the Chowgirls. Amy Lynn Brown and Heidi Andermack—aka the founders of Minneapolis’ Chowgirls Killer Catering—love parties and food, so it only made sense that they took more than 80 of their catering company’s most popular recipes and turned them into a home entertaining cookbook, Chowgirls Killer Party Food: Righteous Bites & Cocktails for Every Season. Here, the ladies share some favorite recipes, perfect for bridal showers or any kind of wedding party. In a medium pot on high heat, bring water and rhubarb pieces to a rolling boil. Reduce heat and simmer for 45 minutes or until rhubarb is completely cooked and fallen into threads. Strain through a fine-mesh sieve into a bowl and pour liquid back into pot. Return to stove, add sugar and bring to a boil, stirring until sugar dissolves completely. Allow to cool. Juice one lime into a shallow, wide bowl. Slice the other lime into rounds. Dip rim of margarita glass in lime juice, then into coarse sugar. Fill glass with ice. 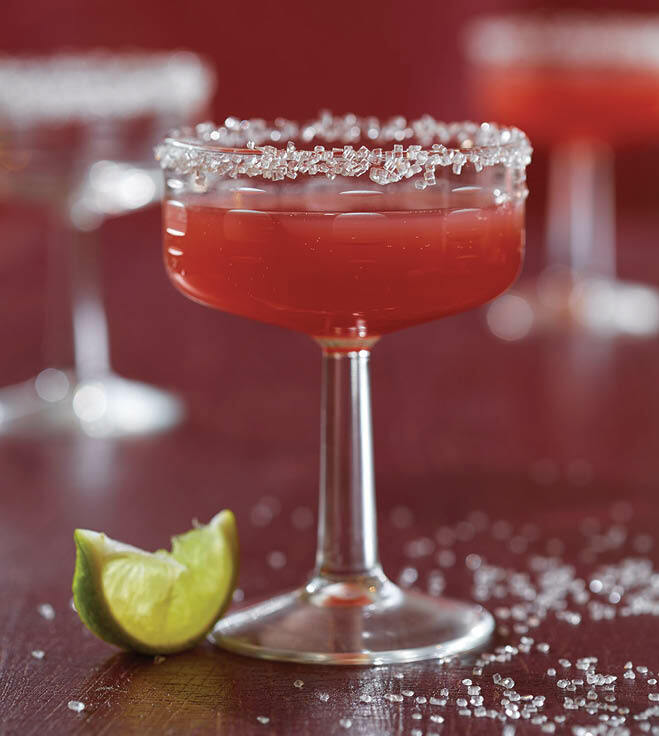 In a cocktail shaker, shake equal amounts of rhubarb syrup and tequila, pour into glasses, garnish with lime slice. Preheat oven to 350°F. Using a sharp bread knife, slice baguette, on a diagonal, into ¾-in slices. Lay slices on a baking sheet and lightly brush with olive oil. Bake on upper oven rack for 15-20 minutes, until edges are browned and crisp but centers remain slightly soft. Remove from oven, cool slightly and rub each slice with garlic until aromatic. Allow to cool on baking rack. If using fresh peas, bring 4 cups water to a boil, add peas and cook for 2-3 minutes. Drain immediately and rinse in very cold water. In the bowl of a food processor, add tarragon, garlic and lemon juice, and cooled or thawed peas. Process 30-40 seconds until well-blended. Add cream, 2 tsp. lemon zest, salt and pepper and continue processing until mixture is very smooth. Spread a generous amount of purée on each crostini, top with gouda, additional lemon zest, tarragon leaves and microgreens. Chowgirls Killer Party Food: Righteous Bites & Cocktails for Every Season ($22.95) is available at local retailers Magers & Quinn, Patina and Corazon, and via the Chowgirls website.